As the running boom started around the world in 1972, Comrades marathon saw 973 finishers for the 90km Up-run challenge between Durban and Maritzburg. In 1975 Comrades introduced the 4:30 marathon qualifier, and a cap of 1500 runners. 1668 entries were received and a “computer” randomly selected the favoured. The following year saw Alan Robb record the first of four victories (5:40:43), and the first finish at Kingsmead stadium. Tracking SA running growth using Comrades Down Run, which has had the same and start and finish over the past 40 years it is easy to see both the increase in race numbers and the change (drop) in performance level, and with that the importance of ‘chip timing’ which has enabled the race to grow. In the 70’s the peak finish was around 9-10 hours, but even with around 10 finishers per minute, officials and referees had time to personally greet each runner. The exponential growth was initiated by the full day TV, the running boom, isolation that meant all competition was within South Africa, and then the charismatic multiple winner, Bruce Fordyce. By 1986 there were 9600 finishers in the 11-hour cut off time, which had been set in 1928. This is 300 more than finished sub 11 hours in 2016, where another 5142 crossed the line before the original, and 2003 reinstated, 12-hour cut off. Without Chip Technology, it would be impossible to record the runners crossing the line, not just at the finish, but also along the way. While the average rate per minute (RPM) of finishers in the final hour is 155, the peak in that last hour can be double that. Those intermediate points at Camperdown, Half way, and Cowies Hill will record in the region of 500, 300, and 200 peaks per 10,000 runners: An impossible manual task. Comrades was at manual capacity in the late 80’s and early 1990’s, where a nylon line was fed through tear off slips. There was even a year when the thread broke and the results had to be pieced together from photo and those time clock back up cards. In 1994, I was invited by the USA Road Running Centre to their symposium in Santa Barbara where we would also ‘assess’ the first Championchip timing offering. Over 30 international officials and measurers tried every imaginable jump, step, and strides to beat the double mat system. The system proved robust and gained in strength and popularity amongst the larger international races. The system came to South Africa through an ‘equipment and use’ partnership with Comrades, that has remained in place since 1996/1997. The immediate benefit was to take pressure away the finish and intermediate timing processing, but was soon being used in the tracking, and prevention /detection of cheating. Although used internationally for at least 2 decades, its only recent years, as club race sizes increased, that Mat to Mat timing was introduced in South Africa. 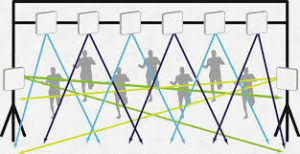 The same can be achieved by either foot or bib chip timing, although not all systems are capable of the same accuracy without the use of back up videos. Jaco Venter from Om Die Dam, which has around 11,000 runners, sees the additional mat and timing costs being warranted by the runner benefits. Venter agrees with Andre Botha, the Safety Officer at many KZN races, that Chip Timing reduces many aspects of race safety. Vaal Marathon Race Organiser Steve Jackson is a major supporter of Mat to Mat timing which he adopted years before Comrades thought to accept net times for qualification. “The biggest problem is the start. In the last few years (at Comrades), I have seen a very dangerous practice creeping in: that is the amount of people who arrive late and jump over the fences to get nearer to the start. I see this is a direct result of the Gun to Gun tradition and you are now pushing that attitude back to the qualifying races,” said ‘Double Green’ Jackson in addressing an October statement from Comrades that they wanted to do away with net times for qualification. “I have used Mat to Mat, since running in Europe and experiencing the lack of stress at the start amongst the rank and file runner. There is just not the press to get to the front and push and shove to go as soon as the gun goes off. Safety at the start is perhaps the highest priority, and ironically was probably first seen in South African at Comrades in the 80’s. With over 7000 runners randomly lining up the starts were becoming chaotic, as runners fought for prime position to minimise the time lost. Climbing fences, literally camping overnight in the start, and many other legal and illegal ‘tricks’ were used to avoid the 20 minutes it took for the last runner to cross the line. It was a recipe for disaster. It affected everyone, elite and back-markers. A runner’s protest saw Comrades introduce seeding: firstly, for the contenders, and then on a voluntary basis, which quickly graduated to defined batches based on qualifying times set in club races. 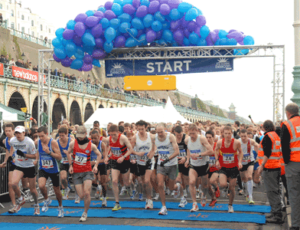 At that stage the qualifying races were small with about 3000 runners which allowed runners to clear the start with minimal delay. For the past few years, qualifying events typically have in excess of 6000 runners crammed into residential roads, and greater numbers in wide roads, making them potential high risk in terms of the Safety In Sport Act 2010. Innovatively at Soweto 2015, times were identified for all the “contenders” for awards, (open top 20 – paying 10, age group top 6 – paying 3), and any runner who could prove his / her performance better than that time could apply to be seeded at the front. Of the 5000 plus marathoners, only around 100 met the time requirements and occupied a small section at the front of the event. It was then announced that mat to mat times would be provided, and that everyone else could take their time to get over the line in a relaxed, courteous, safe and friendly fashion. This format was introduced at Johnson Crane, Vaal, Om Die Dam, Sarens and many others. The approach is gaining popularity, and is changing the whole atmosphere at the start of events. •	Runners benefit from more accurate times and a better reflection of their performance. •	Organisers benefit by a risk reduction, more relaxed and civilised attitudes not just at the start, but in all build up aspects. •	Officials have an ability to ensure finishers have not jumped in down the course. •	Those competing for prizes are given a clean getaway, while those wanting fun can enjoy a carnival atmosphere. Johnson Crane Race Director, Ashvin Jivan, summed it up when, one month after the initial announcement, Comrades race organisers did an about face to accept Net qualifying times. “The gun-to-mat would have been disastrous for the Johnson Crane event, imagine 7000 marathon runners trying to get to the front of the start area. This would definitely be a concern for all. Safety of the runners is paramount,” continued the Benoni Harriers man, one of the first up-country qualifiers of the new year. Technology opens many doors, and with some ‘out of the box’ thinking, wave starts, and some innovation with medal distribution at the finish, it is not unforeseeable that one day qualifiers, and even Comrades and Two Oceans, will be able to cope with even greater numbers, and still ensure that the correct medal and race cut offs being applied. 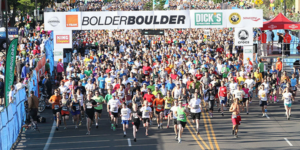 After all, for years over 50,000 runners have lined up in The Bolder Boulder 10km, which uses around 100 waves each separated by 1 minute. The fastest race is the Pro Race held last, but with massive spectatorship, as the other runners wait to cheer them home! With open eyes and minds, Technology can change and bring safer and bigger rewards!